Today was a somewhat somber day so your Ramblers apologize for the tone of this entry. We visited the American Cemetery at Normandy, Omaha Beach and Pointe du Hoc. The visitor center at the cemetery is excellent, and frankly every American should visit this place once in their lives. The enormity of the task to take the beaches and cliffs there is hard to fathom. The D-Day landing took place at low tide so many of the underwater obstacles and traps could be avoided by allied landing craft. However, that decision resulted in the troops having to traverse a much wider beach before any cover was available. Your Ramblers stood on that beach at low tide and it is the widest beach we have ever seen. It is probably 150-200 meters from the water line (landing craft did not make it that far) to the first dunes. A steep hill immediately follows the dune line. [Rambler Hance’s thoughts: If I had been standing where I was 69 years, 1 month and 11 days prior, the three most likely outcomes for me were 1) I was dead already, 2) on my way to being dead rather soon or 3) about to have a close personal encounter with a projectile.] The opening scene of Saving Private Ryan seems a little more real, except I think the filmmaker did not do justice to how wide the beach actually was. I was also looking at it sans two levels of barbed wire, a tank trap trench, land mines and about a million rounds of flying lead looking for a home. With all of the above stated, the beach and surrounding areas are beautiful. We visited on a gloriously sunny day, the water was blue, the cliffs and hillsides green and the arc of the coastline reminded us of parts of California with its abrupt elevation change, cool water and low humidity summer weather. After traipsing on the beach, your Ramblers climbed a hill that looked down on Omaha Beach and visited the remains of some German pillboxes and cement bunkers/gun placements along with a memorial to the 1st Army Infantry Division l (the Big Red 1) and a memorial to the combat engineers of both the Army and Navy. 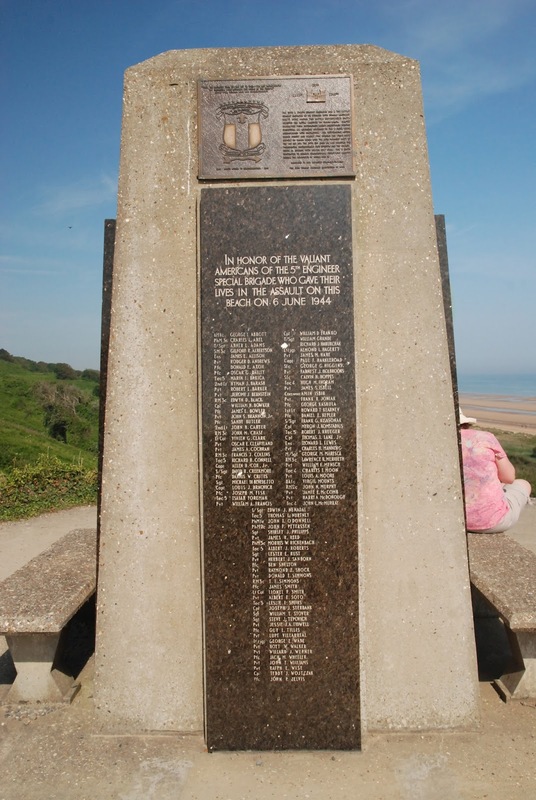 The engineers were among the first ashore with the job of blowing holes in the obstacles the Germans had placed on the beach to widen the road, so to speak, for tanks, men and machines. Needless to say, at that moment in time, it was probably the most dangerous place on earth. From on high, with that big wide beach below and the man made traps and obstacles strategically placed it is hard for these non-military experts to imagine a more perfectly designed killing field. 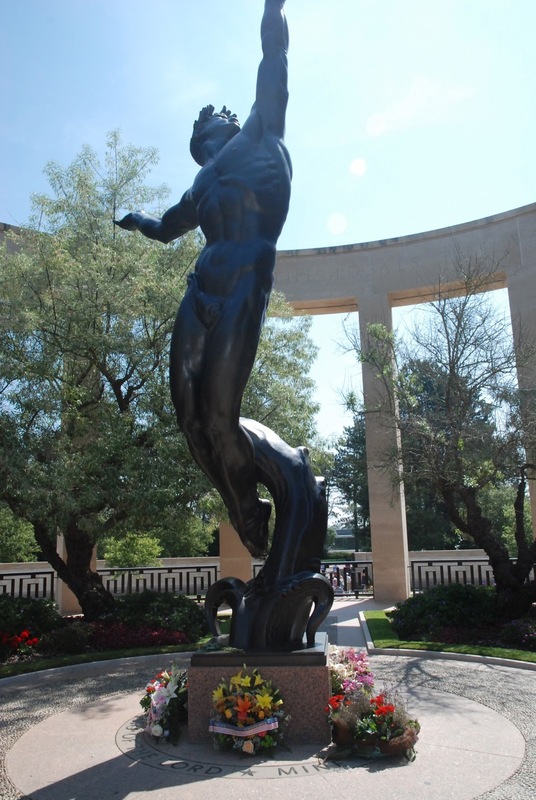 After we left Omaha Beach, we walked to the American Cemetery and exhibition center. It is very well done--it tells individual stories and gives a sense of statistics of the landing undertaking; the preparation, equipment and mistakes made. The cemetery is a little hard to take, frankly, due to the number of graves present (that would be 9,387). If you visit to see a specific grave, consult the directory for its location because we could not ascertain a system of burial. Sculpture called "Spirit of American Youth"
After leaving the cemetery, we traveled down the road a few kilometers to Pointe du Hoc. 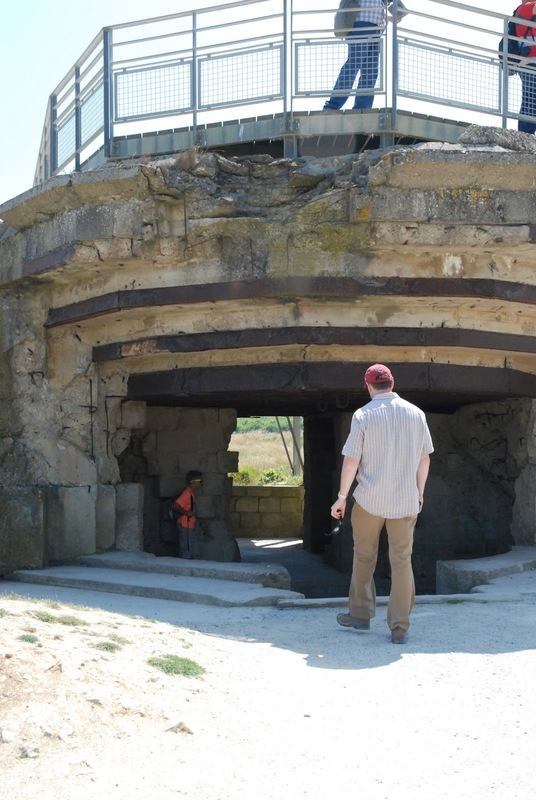 Pointe du Hoc was a strategic point in the allied landing plans because it contained (or at least it was thought to contain) several large German guns. Positioned as it was between the American beaches, Omaha and Utah, it was necessary to take it out in order to prevent it raining death on the American landing zones. 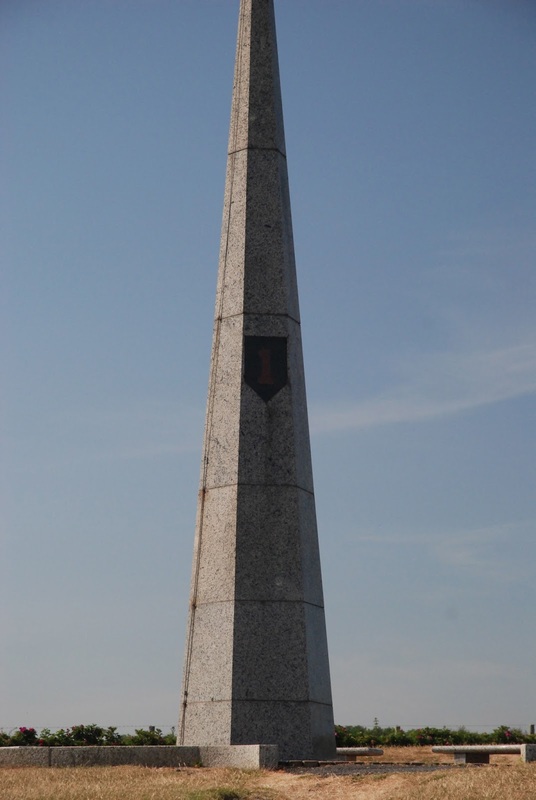 A group of American Rangers, who were specifically trained for this task, landed at this site and using special climbing gear, climbed and fought their way up a sheer cliff and took the position. When the Rangers arrived, the guns sought were not there, but they continued inland several kilometers, located the guns, and destroyed them. They then stayed there, holding a key road for several days until reinforcements arrived. As Bill Rafterty would say, “Onions”. We did a walk around, and the area was left largely as it was that day sans any armaments. 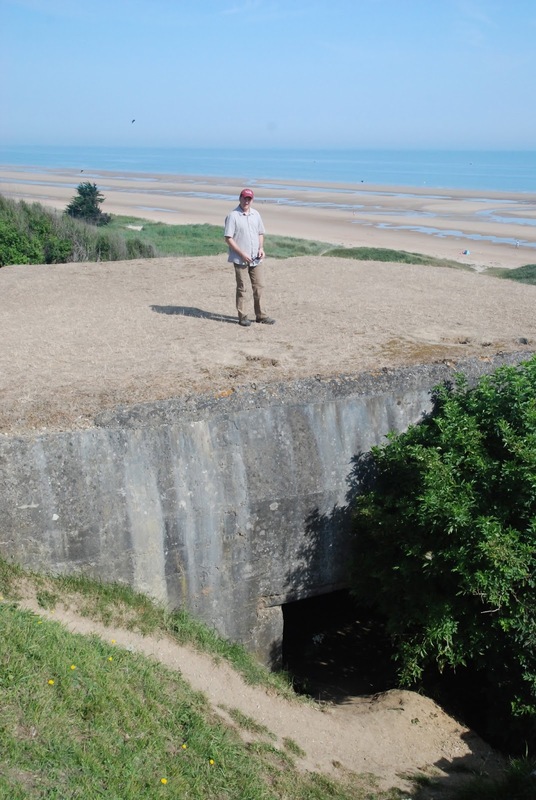 The landscape is littered with dozens of craters 10 feet or so deep left by bombs, rolled barbed wire lines the face of the cliff, and the German bunkers and gun placements are numerous. A visitor can still see large chunks of the very thick concrete walls of the German positions blasted away and imagine shells of all types hitting the structure. We also went into one bunker where clearly a fire had taken place. Whether from an explosion and subsequent fire or from Rangers using flamethrowers, those small concrete rooms would have been hell on earth either way. After the somber morning we drove our little car back into Port-en-Bessin-Huppain to find a little lunch and refreshment to lighten the mood. We found a wonderful little place with patio dining and split a grilled ham and cheese sandwich (cheese on the outside of the bread?? 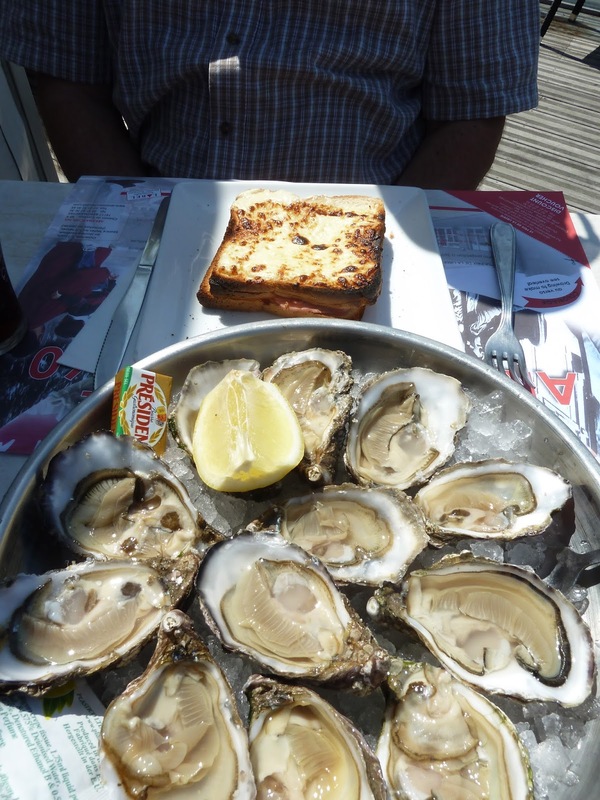 ), a dozen Normandy oysters and two Coca-Cola Lights (Diet Coke), again in the green bottle. The oysters were top notch. And by top notch, I mean Eastern Shore seaside, salty goodness top notch. After lunch we retreated to our hotel/chateau to catch up on blog entries and email, and plan dinner. We located dinner with the help of the hotel staff. We wanted seafood, after walking the waterfront in Port-en-Bessin-Huppain and tasting our oysters. We selected Fleur de Sel and got a street side seat. Rambler Jane got the salmon steak and Rambler Hance got the seafood platter (steamed) with sea snails, prawns, a crab (something like Dungeness), snails, shrimp, mussels and very small langoustines. It was pretty good but frankly was the most nondescript meal so far. The seafood platter was steamed but cold (think cocktail shrimp temp but for everything). It would have been better hot but wasn’t bad. Rambler rating: 3 stars. After dinner we retreated to our room to prepare for tomorrow's train trip to Paris, which meant turning in the rental car and saying a bittersweet goodbye to Gabrielle, our GPS.